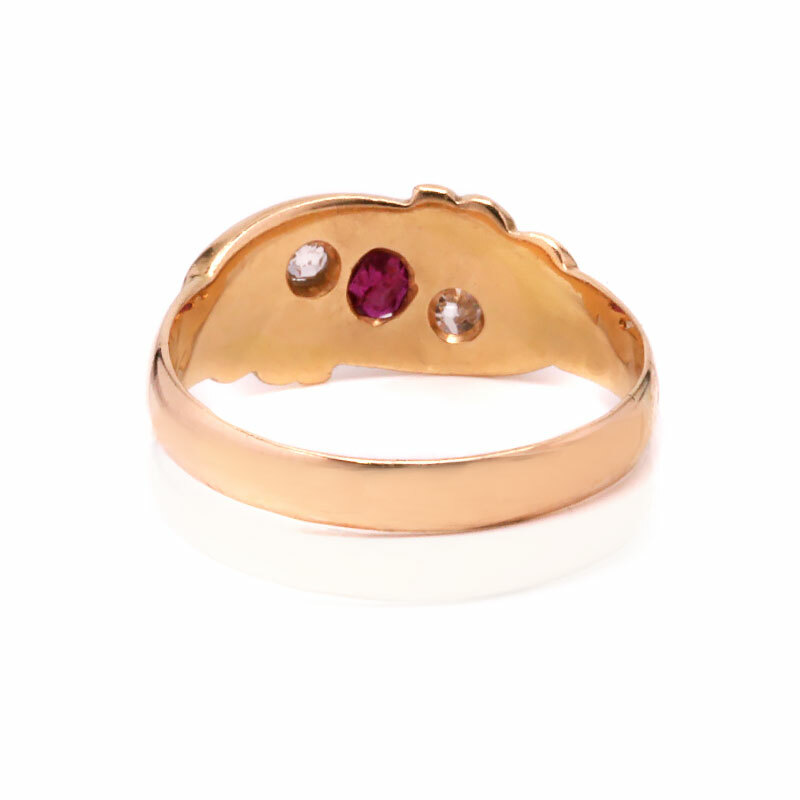 Product code: ES8358 Categories: Antique, Antique Rings. Here is a ring that is perfect for any finger and any occasion, a very lovely antique ruby, diamond and pearl ring made in 1916. Made in 18 carat yellow gold, the design of this ring sits so well on the finger with a soft curve to the design and all the gemstones set low into the band which is further highlighted by the charming scroll work on the sides. Sitting in the centre is a very vibrant natural ruby that measures 0.20 carats, followed by a European cut diamond on each side that totals 0.10 carats and finally a seed pearl set at each end. Measuring 7.7mm wide at the centre by 15.3mm across from one side to the other, this is a very comfortable and practical ring to wear all the time. Antique rings in this design are perfect for any woman of any age and will always be loved and admired. This antique ring is set with a beautiful natural ruby, two European cut diamonds and finished with a seed pearl at each end. Sitting so close to the finger, this is a wonderful example of a genuine antique ring that will so easily suit any finger as well as being perfect for any occasion. Very comfortable and easy to wear on a daily basis, this antique ring was made in 1916 and looks as beautiful today as when it was made right in the middle of World War One.